9 – Where all do the buses travel? 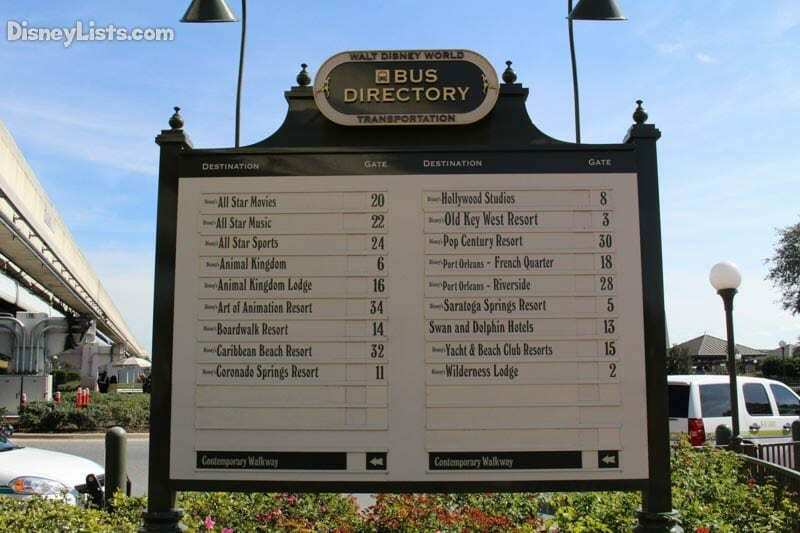 The bus transportation all over Walt Disney World Resort runs picks up and drops off at all of the theme parks, water parks, Disney Springs and each of the resorts. 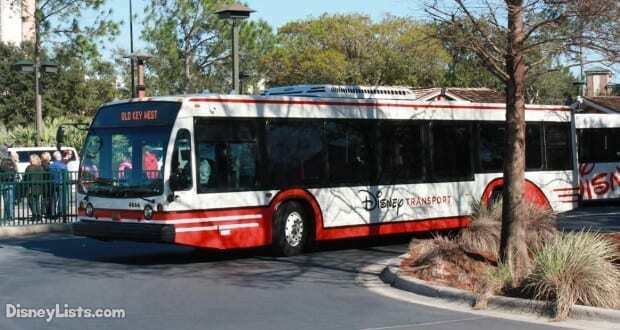 You can get to just about anywhere at Walt Disney World resort via bus transportation. You may want to ask the fastest route if there isn’t a direct route from your location, as there can be a variety of ways that you can get to certain places, but in general it is very simple to navigate your way using the buses. 8 – How often do the buses arrive? The buses typically arrive every 20-25 minutes for each route. If you arrive at the bus stop and no one is in line, it can sometimes mean that the bus may have picked up recently for that stop. At the resorts there is a video monitor that will tell you how long until the next bus is expected to arrive. Knowing the expected arrival time is so helpful in knowing how much longer until your specific bus is there. 7 – Know when the buses start and stop running each day. The buses typically start running about 45 minutes before parking opening and continue running all day until an hour after park closing. There is usually a very early bus that will come through to get guests to various character breakfasts. You can ask the front desk at your resort for the time of the earliest bus if you need to get there early. The buses run until 2AM between the resorts and Disney Springs, so have no fear about hanging out late into the evening there. It is extremely convenient! 6 – Always take the bus (or other transportation that doesn’t require you to drive) to the Magic Kingdom. There are some guests who like to drive around the resort (I am definitely not one of them), but the Magic Kingdom is one park I don’t recommend driving to if you are focused on getting the best use out of your Disney time. If you drive to the park you have to park at the Ticket and Transportation Center and then make your way either walking or via tram in order to catch the monorail or the ferry to get to the front gates of the Magic Kingdom. While the monorail and ferry are both magical and a lot of fun, the whole process can take a while. If you take the bus, you get dropped off right by the main entrance with an amazing musical fanfare when you arrive. You get to the magic faster! 4 – Don’t leave with the herd at park closing. It may seem like the natural reaction to follow the herd right out of the park, but don’t do it! First you want to make sure the park is actually closed. For example after some of the evening shows, the parks aren’t necessarily closed, but guests just think that is the case and make a mass exodus at the end of the show. Either way, if you leave right when all of the other guests are leaving you will just be waiting in bus lines, as it can take a couple of bus cycles to get the guests all picked up. You can spend the time looking at more of the details around the park, cruising the gift shops, interacting with the cast members and soak up more of the Disney magic rather than standing in line for the buses. Once the herd thins out for a while you can make your relaxing walk to the buses, too! 3 – How to get from your resort to another resort. There are so many great dining options and other things to see across all of the many resorts that you will definitely want to explore. There aren’t bus routes that go back and forth between resorts, so you have to get a little more creative, but it’s pretty simple! You just take a bus to one of the theme parks and then take a bus to the resort from there (or sometimes take a monorail or boat if it is an option). It is best to take a bus to a park that is close to where you are trying to end up. If you are going to breakfast at Chef Mickey’s at the Contemporary, then you will definitely want to take the bus to Magic Kingdom. If you are going to a meal over at Animal Kingdom Lodge, then you will definitely want to take a bus to Animal Kingdom first. If you aren’t sure what is closest to the resort you are trying to get to, just ask! A cast member at the resort will be happy to help. 2 – Leave at least an hour before you need to be at your destination. 1 – Water Parks share bus routes. You may notice that there isn’t a separate route for Typhoon Lagoon or for Blizzard Beach. For the water parks, they will share a bus with one of the other locations. Usually Animal Kingdom and Blizzard Beach will share a bus route and then Disney Springs and Typhoon Lagoon will share a bus route. Be sure to double check at the bus depot at your resort to ensure that there are no changes to the routes.